Once Upon a time in the land of Leprechauns lived Grace O’Malley | don't bite the apple…work is not a fairy tale! Once Upon a time in the land of Leprechauns lived Grace O’Malley. According to Irish legend, as a young girl wished to go on a trading expedition to Spain with her father, and on being told she could not because her long hair would catch in the ship’s ropes, she cut off most of her hair to embarrass her father into taking her and she never looked back. 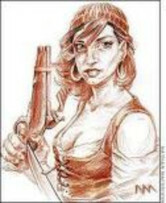 Her exploits were many and she became known as the Pirate Queen of Ireland. Even in 1530 Women wished to do things the men did. Every once in a while, one broke out and became a legend that would live forever in the stories told to young girls as what they could accomplish and to young men on what never to underestimate. I visited Grace’s dungeon and saw her hideout in a cove when I was in Ireland. Standing at the edge of the water imagining her on a ship, I asked myself…What are the things you want to do and are afraid to try? My life has never been the same and I think of her often! In times when work stress gets you down, how do you dig out and keep a steady course to your dreams? How do you sometimes just keep your head above water? I was asked the other day to talk about what employees should do to get a job or keep a job in this economy. Be Grace O’Malley, be fierce. If you can’t figure out how to get something done, find an unorthodox way. Cut off your hair, meaning the unnecessary part of the equation. Ask for more responsibility and not extra pay. (It will come later) Stay late, come in early and be seen doing it. Send emails from your desk at 7:30 am and 8:00 pm, people notice. Do you want a promotion? Ask you boss what you need to accomplish to make that happen. Realize that when your company looks good, so do you. Are you Grace O’Malley in your personal life? Being strong and brave outside of work can change you personally. You become confidant and someone people want to be around. This spills over into your work like, making you more successful all around! Set some goals and work hard to achieve them. Run a marathon, get involved in the community or volunteer. Share your accomplishments with those around you! Around St. Patrick’s Day there is a lot of talk about magic and miracles. You don’t need a miracle; you need to be the one person that others can’t live without. Are you Legendary? What have you done to stand out at work? Tell us in the comments, we want to hear from you. On St. Patrick’s Day, I think we should all be like Grace O’Malley!